Word on the street is that a developer and architect have been selected. Not if. When will the New-York Historical Society announce its selection of a developer and architect from its short list to build a 280-foot tower, forever changing the architectural profile of Central Park West? Sign your name to the online petition urging the Society to be upfront with the community, make its process transparent, and hold a public forum on its plans to develop its site on Central Park West between 76th and 77th Streets. Send the petition to your friends and neighbors. 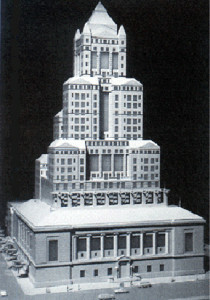 As reported in the New York Times on November 1 andDecember 30, 2006 , the New-York Historical Society plans to redesign the façades of its Landmark building on Central Park West and West 77th Street; build a 280-foot glass tower on West 76th Street looming over the Landmark, with a base on the West 76th Street townhouse block; and add a large penthouse directly on top of the Landmark. The Historical Society’s announcement arrives on the heels of other major alteration/construction projects proposed in historic neighborhoods all over Manhattan – in some cases, approved by the Landmarks Preservation Commission. If this Landmark can be defaced, all are at risk. If a tower can be built here, one can be built anywhere in our city. For the latest news, please visit LW!’s “Watch-Blog” and email us to make sure you’re on our list to receive important updates. While the Historical Society has filed plans with the NYC Landmarks Preservation Commission for the façade changes to the Landmark, it has refused to disclose information to the public about the tower portion of its project. Click here to read a letter by Bill Moyers on the Society’s “divide and conquer” strategy. This project is one of many such building schemes threatening historic neighborhoods all over our city. Approval would provoke a widespread domino effect all along Central Park West and beyond. “Only two buildings have been constructed on the avenue in the past twenty-five years, thusCentral Park West remains much the same as it was in the 1930’s, and retains the architectural variety and dramatic silhouette that make it a unique presence in New York City. The 4-story Historical Society is among the institutional buildings, including the adjacent American Museum of Natural History and Fourth Universalist Society, that “display design qualities that complement the residential character of the area,” according to the 1990 report. Like the majority of side streets included in the Upper West Side/Central Park West Historic District, West 76th Street is defined by 4-story rowhouses on the midblock. In 1984, the Landmarks Commission turned down an application to construct a 23-story addition on top of the Historical Society. The Historical Society’s latest development scheme would require special permits not only from the Landmarks Commission, but also the City Planning Commission. To learn more about the history of the New-York Historical Society’s 1984 plan, please visit our N-YHS Archive page. The proposed façade alterations would undo a series of sensitive, Landmarks-approved, award-winning renovations completed in the mid-1990s under the direction of Beyer Blinder Belle, the firm that guided the restoration of Grand Central Station. Read more about this in LANDMARK WEST!’s Open Letter to the New-York Historical Society: Part II. The Historical Society is seeking special exemption from the laws that govern all other property owners by putting forward a development scheme that would undermine their Landmark environment, apparently without any serious investigation of other fundraising options. It has not pursued proactive, high-level fundraising to build its endowment, which it depleted through misspending in the 1980s. 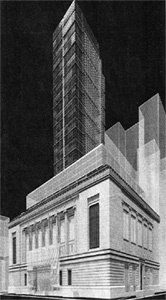 The 1984 tower proposal was the Society’s first effort to use development to close its spending gap, but that tower was rejected as against the public interest. Even under a financially optimal development scenario that enabled the Society to substantially increase its endowment, the institution would still face a significant budget gap each year. And if the tower and annex are built, the Society will face significantly increased operational costs. Click here for LANDMARK WEST!’s Open Letter to the New-York Historical Society Part I. The public will pay the price for the Historical Society’s egotistical scheme if it gets approved. The Central Park West façade and skyline will be irreversibly compromised, the City will continue to funnel taxpayer money into an institution that has consistently failed to bring up its end of the bargain, and the precedent will be set for destroying more of our city’s Landmarks and Historic Districts through needless overdevelopment. Submit your information below to sign on to support SOS today! Note*** – Pressing “Submit” will open your email program. If you do not want to do this, please send an e-mail tolandmarkwest@landmarkwest.org with the information asked for above. Please also include the message given or one of your own. The subject line should read “In Support of SOS.” Thank you. Allen Staley, Professor Emeritus of Art History at Columbia University: “…76th Street between Central Park West and Columbus Avenue is one of the most beautiful blocks in New York…and I believe that a large scale construction of the sort that seems to be envisioned can only be to its detriment,” in a 1/24/07 letter to the New-York Historical Society. Philip Johnson, architect: “If the Landmark Law has any meaning at all, it is to prevent the defacement (really means destruction) of building that have historic significance. Beyond this, the low profile of the [Landmark] is a very important caesura on the cliff-like heights of Central Park West….Civically and architecturally, the addition would be a disgrace for the community,” in a 1/18/84 letter regarding the 1984 tower proposal. James Stuart Polshek, architect and former dean of the Columbia University Graduate School of Architecture, Planning and Preservation: “The architecture of the tower is not in question but its negative impact on the string of historical, cultural and architectural landmarks that grace the West Side of Central Park would be profound,” in a 1/23/84 telegram regarding the 1984 tower proposal. Robert A.M. Stern, architect, dean of the Yale School of Architecture, former director of the Columbia University Historic Preservation Program and author of New York 2000, etc. : “The Historical Society is one of a series of public buildings erected at the turn of the century on Central Park West which in concert form a chain of monumental gateways to the West Side…These buildings remain as a testament to the low-scale Classical urbanism of the City Beautiful movement. Threatened though they are with redevelopment, they remain individually too precious to the city’s urbanism and sense of its own historical evolution to allow drastic development of the kind under consideration,” in a 1/13/84 letter regarding the 1984 tower proposal. Andrew Dolkart, James Marston Fitch Chair and Associate Professor of Historic Preservation, at Columbia University: “…the unique character of this section of Central Park West would be severely compromised by the proposed Historical Society tower, which would alter the rhythmic quality of Central Park West as we know it,” in his report for the Central Park West Preservation Committee regarding the 1984 tower proposal. Click here for his 1/26/84 letter.